MONIC, the original developer of clear floating fly lines, has just released a new line series, dubbed the FST (“Fish Specific Taper”), designed with unique tapers for redfish, permit, tarpon and bonefish. Over the past two seasons, I have had a chance to test the FST lines under demanding, technical situations on the flats of the Florida Keys. Wise old fish in heavily pressured waters demand attention to detail when it comes to making sure your lines are properly rigged and presented, and I’ll admit to being slightly obsessed about having the right fly lines for the right circumstances. The advantage of fish not seeing a fly line both in the air and the water cannot be overstated. From permit in clear skies and bright sun, to reds and snook in back-out-of-the-water skinny stuff, fish are amazingly adept at seeing the line in the air, even when using a low angle cast and minimizing false casts. Similarly, an unseen bonefish that swims near or under the end of a colored line will often spook the whole school, whereas a clear line is often much more tolerated. There are days that even the movement of your casting arm sends fish scurrying, so I’ll take any advantage one can gain with these finicky fish. Therein lies one of the big challenges of fishing with clear lines: the ability to track the fly is quickly lost when you begin stripping it back in from seventy feet away. Monic’s Phantom Tip lines are made with a green tint in the main belly and a 10-foot clear tip, but I am rarely able to track the tinted line unless lighting conditions and bottom color are optimal. So, as my friend Tim Mahaffey has said, fishing clear lines takes commitment: you learn to pay close attention to where your fly lands and where your line is in the water, and you carefully watch the fish. In essence, clear lines force you to become a better angler. I was initially skeptical that the abrasion resistance of the monofilament-based lines would be comparable to PVC-coated conventional lines, but after a recent tarpon tournament in which a fish ran through and around a barnacle-encrusted bridge piling, raking the clear line and much of my backing across the obstruction, I was convinced otherwise. After we miraculously released that tarpon, I inspected the line and found it to be essentially without a scratch and entirely fishable. With the introduction of the FST series, Monic also improved the stiffness of the lines to prevent them from wilting in the heat, yet the line is easily stretched with just minimal pressure and does not coil excessively coming off the reel. The harder, slicker finish helps eliminate the tackiness caused by very hot, still conditions — a problem some complained about with earlier lines. In my opinion, ultra-stiff, ultra-hard finish lines are very durable, cast well and almost never tangle, but a wiry line lands too firmly on the water to make a gentle presentation. The FST delivers a hard-enough finish, but allows that critical ability to make a soft presentation. To perform at their best — at least in the way that I fish them — all fly lines require frequent cleaning and dressing during a day’s fishing, as well as at the end of the day. Monic lines especially benefit from use of their proprietary dressing, MicroSlick, to improve handling and increase distance. Monic has two fly lines of particular interest to the tropical saltwater fly fisherman: the Tropical Phantom Tip line, a green-tinted main line with a 10-foot clear floating tip, and their all-clear, Fish Specific Tapers (FST) lines, designed with four specific tapers for tarpon, bonefish, permit and redfish. In general, a fly line with a longer front belly allows an angler to hold more line in the air, cast further and land more softly. A short, fat front taper allows for quick loading of the rod at short distances especially with bulkier flies. Striking a balance between these two extremes to allow the majority of anglers to make a decent presentation under a variety of conditions is the goal of line designers. 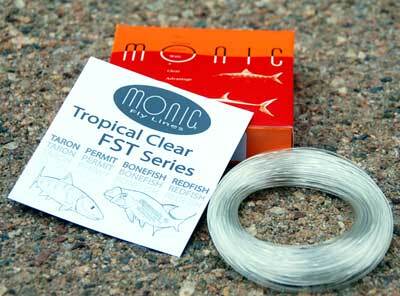 Monic achieves this goal exceedingly well with their FST lines in the bonefish and redfish category. The longer leaders and accurate, delicate presentations required in Keys bonefishing are well suited for the longer taper of the FST bonefish line. Even under bright sun or when fish are in deeper water with a larger refractive “window” with which to see me or the boat, fish rarely spook from the FST. 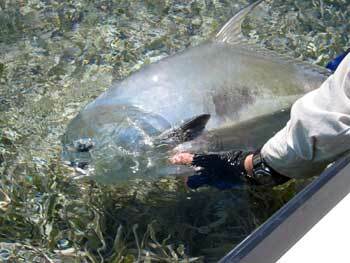 (Believe me, Keys bonefish can and will spook from a myriad of other reasons.) The redfish line, with its short front taper, easily turns over bulky flies at the shorter distance most redfishing requires. For typical permit and tarpon fishing, the Tropical Phantom tip line, with its aggressive 7-foot front taper, is the line I prefer, as it loads the rod well at short distance and easily turns over long leaders or heavy flies, even in the wind. It is stiff enough to resist tangles and shoot through the guides well, but supple enough to land reasonably well on the water. For tarpon and permit under calmer conditions, however, I choose the FST line with its longer front taper It offers better distance and accuracy with more control of line speed, which in turn allow a more delicate presentation. Overall Impressions: The improved, “slicker” line coating shoots well (especially when shooting line on the backcast). Taper allows for good distance yet still maintains a precise presentation. Leader and fly turned over well. Better balanced than Phantom Tip with test leader and fly combo. Longer head definitely a plus with bonefishing situations. Loaded test rod well, and re-cast was excellent even with fairly short amount of line out of the rod tip. Delivery was soft, the rod loaded well and line speed was excellent. Overall Impressions: The line’s slick finish and hard coating shoots through the guides well and lays straight with only minimal stretching. The FST Permit taper’s longer head had a bit of difficulty turning over the heavy crab fly straight into a brisk wind, but most lines would given these conditions. Downwind and cross-wind the line handled very well. The Phantom Tip, with its more aggressive taper, naturally handled heavier flies and wind better, but the FST Permit line excelled at accurate delivery, essential for permit angling. Monic fly lines are available for a full range of fishing applications. See the Monic Web site for more details.